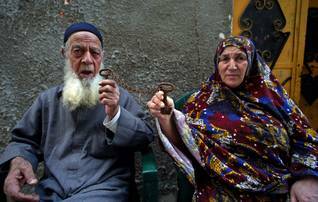 Sixty years after their exodus, Palestinian refugees embody the very essence of ‘refugeeness’. They constitute the ‘oldest’ and most numerous refugee population in the world. Estimated at over 720,000 in 1949, they represent, together with their descendents, a population of over six million today. Two-thirds are currently registered with a United Nations humanitarian agency especially devoted to catering for their basic needs: the United Nations Relief and Works Agency for the Palestine Refugees in the Middle East (UNRWA). This agency operates in the West Bank, the Gaza Strip, Jordan, Lebanon and Syria. Palestinian refugees have received exceptional media exposure due to their involvement in the conflicts that have scarred the Middle East. The ordeals suffered by Palestinian refugees in Iraq since 2003 simply echo the refugee communities’ fate in Lebanon during the Civil War in that country (1975-1990) or in the West Bank and the Gaza Strip in the context of the Israeli occupation since 1967. At the same time, the Palestinian refugees’ attachment to their ‘right to return’ is often considered a major stumbling block in the Israeli-Palestinian Oslo Process. Across the Middle East, the Palestinian refugees’ overall impact on the host countries has been ambivalent: while it is generally recognized that they have contributed positively to their socio-economic development whenever they have been given the opportunity to do so, the poorest refugees – and more especially the refugees in the camps – have been portrayed in terms of a threat to the economic, social and political stability in the host country. This is especially the case in Lebanon, where camps are not covered by the host country’s security apparatus, and have served as a haven for Palestinian military factions and unlawful militias. Yet, for all their public exposure, available information about the Palestinian refugee issue is fragmented at best, contradictory at worst. This stems first from the ambivalent status of the Palestinian refugee issue as both a humanitarian and a political issue. It also results from the absence of any international definition of the Palestinian refugees and the ensuing uncertainties about their exact numbers. The only available database concerns the 4.7 million refugees registered with UNRWA on purely humanitarian grounds the ‘Palestine refugees’. It excludes all those non-registered refugees, for instance, those who did not reside in one of the Agency’s countries of operation. A third source of confusion derives from the various legal statuses that have been conferred on the refugees by the Arab host countries – from formal citizenship in Jordan to foreigners in Lebanon. In each of the host countries the refugees have been divided into various social subcategories – camp versus non-camp refugees, for instance. Despite this diversity, the Oslo Process has treated the refugees as one unitary group, subjected to stereotypical integration options in terms of repatriation to Palestine (mainly the future Palestinian state in the West Bank and Gaza Strip), permanent resettlement in the present host country or a third country, and compensation. However, neither the main host Arab countries, nor the refugee communities have so far had a voice in the bilateral (and mostly secret) Israeli-Palestinian talks. This has undoubtedly contributed to casting doubt upon the relevance and practicality of any Israeli-Palestinian peace plan. How can we account for the diversity of the refugees’ experiences sixty-three years after their departure from Palestine? To a great extent, while the Palestinian refugees’ situation is influenced by current opportunities and constraints specific to their host country in the context of war or of a stalled peace process, it is still heavily determined by decisions that were taken by the main stakeholders involved in their ‘management’ in the wake of their exodus. It is therefore important to offer an historical account of the institutional framework that was put in place at the United Nations and in the Arab countries in the wake of the 1948 Arab-Israeli war in order to define the Palestinian refugees’ modalities of integration. Also there is the question how the peace process has altered the status quo upon which the relationship between the Palestinian refugees, their leadership, the host countries and UNRWA was predicated, especially with respect to the significance of the right of return. Following the first Arab-Israeli War (1948-1949), the bulk of the Muslim and Christian ‘Arabs from Palestine’ residing in the regions that were to form Israel’s territory lost their homes and their means of livelihood. The term ‘Arabs of Palestine’ was used during the British Mandate period to designate the Muslim and Christian communities. It remained part of the United Nations lexicon until the late 1960s. The Palestinians’ exodus started as early as November 1947, when the first skirmishes between Palestinian and Jewish militias broke out throughout the country. It reached a peak from April to July 1948 (namely from the weeks that preceded the declaration of Israel‘s statehood to the time when the main Palestinian cities surrendered), when over 300,000 Palestinians went into exile. The last 1948 Palestinian exiles were the inhabitants of al-Majdal Asqalan (Ashkelon), who were expelled in early 1951. 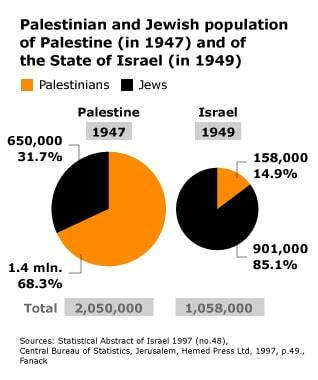 In 1949, the remaining Arab population in Israel amounted to 158,000, versus a Jewish population then estimated at 901,000. The origins of the Palestinian refugee problem, one of the most sensitive issues in the historiography of the Arab-Israeli conflict, are of crucial political importance, since they address the question of responsibility for solving this problem. Ever since 1948, the Israelis and the Palestinians have tried to impose their own narrative. Successive generations of Israeli officials have maintained that the Palestinians left their homes on the orders of their own leaders, or voluntarily. On their part, the Palestinians contend that they were expelled – or transferred – forcibly from their homes. Tapping into a wealth of previously classified state and private papers, a number of Israel’s so-called New Historians have, since the mid-to-late eighties, challenged the official version of a voluntary exodus. Yet, they have not been able to reach a consensus. Some have given credit to, and even reinforced, the Palestinian narrative, shedding light on the existence of a pre-prepared transfer plan. Others have contended that forcible transfer and expulsion measures were just one of a series of factors that also included psychological warfare and fear of Jewish attacks. Be that as it may, the core issue is not so much the conditions of departure, but Israel’s refusal to allow the refugees to return to their homes, in accordance with the provisions of relevant international law. The role of Israel in the creation of the refugee problem must indeed be considered in the light of the measures its leadership adopted as early as 1948 in order to secure the perpetuation of its Zionist project. These have included the destruction of nearly two-thirds of over 400 abandoned Arab villages as well as the adoption of a set of legal regulations aimed at expropriating the Arab landowners. Amongst these stand the Emergency Regulations on the Cultivation of Abandoned Lands (June 1948) and on the Absentees Property (December 1948) that were later embodied in the December 1950 Absent Property Law, under which the refugees’ properties were nationalized. In 1953, the Land Acquisition Law further allowed the confiscation of land for military and Jewish settlement purposes. In light of the international instruments, it is clear that the expulsion of Palestinians from their homes and lands since 1948 is a violation of the obligations of Israel under international law. Restitution is a form of restorative justice allowing the Palestinian victims to return, as far as possible, to their former situation before the violation of their rights. In the case of the loss of housing and land experienced by the Palestinians displaced in 1948 and in later conflicts between Arab countries and Israel, especially in 1967, restitution is understood as the return of property that Palestinians lost, so that the returning refugee re-acquires the title and actual possession of the lost property. The remedy of compensation should only be envisaged under international law when ‘restitution is not possible or when the injured party knowingly and voluntarily accepts compensation in lieu of restitution’. Although many United Nations (UN) resolutions hold Israel responsible for the fate of Palestinian refugees and request their return to their homeland, Israel has refused to comply with its obligations and continues a policy of illegal displacement and expulsion of Palestinians. The UN recognized the Palestinian right to return in 1948 in Resolution 194 (III) which states in paragraph 11 that ‘the refugees wishing to return to their homes and live at peace with their neighbours should be permitted to do so at the earliest practicable date, and that compensation should be paid for the property of those choosing not to return and for loss of or damage to property which, under principles of international law or in equity, should be made good by the Governments or authorities responsible’. The Arab countries were originally reluctant to accept this resolution because they feared this would imply recognition of the State of Israel. In the spring of 1949 their position reversed and they consequently adopted the resolution as part of their policy towards Israel. Since then Resolution 194 has been reiterated by the UN on an almost annual basis. For the Palestinians, the right of return stated in the resolution is still at the heart of any peace talks aimed at resolving the conflict with Israel. It is ‘central to the Palestinian national narrative of struggle against overwhelming odds of expulsion from the ancestral homeland, of dispersion and of national constitution’. The attitude of both parties to the conflict has been diametrically opposed since the Lausanne Conference, in 1949, when members of the UN General Assembly held the position that Resolution 194 was the basis for the solution of the refugees’ problem. Successive Israeli governments have strongly opposed the idea of the return of the Palestinians and have vehemently justified their position, considering it as an equivalent to the suicide of the Jewish State. The first Basic Law of Israel, the Law of Return, provides exclusively for Jews from all over the world to immigrate to Israel. Consequently, Israel has adopted a policy that categorically rejects repatriation and views resettlement of Palestinians in Arab countries as the only answer to the refugee problem. The Israeli government has frequently reiterated the stance taken in 1949, namely that ‘UN Resolution 194, like all other resolutions of the UN, is not binding and there is no basis in international law for the right to return’. Israel has refused to acknowledge ths right, despite repeated criticism by the Human Rights Committee on Israel’s refusal to allow the Palestinians to return in conformity with its obligation as a member of the International Covenant on Civil and Political Rights. The fact that the Law of Return applies solely to Jews regardless of their place of origin, is defended by Israel on ideological grounds which are at the heart of Zionism: ‘The law of return personifies the essence of the Jewish State as a Jewish and democratic state.’ Furthermore, it has stated that its immigration policy is a domestic matter and that it has the right to deny Palestinians the same return rights as Jews enjoy under the Law of Return. Since 1948, Israel has repeatedly stated that it is only willing to allow the return of a limited number of refugees on humanitarian grounds. Essential and inherent to the ‘humanitarian’ motives is the denial of any responsibility towards Palestinian refugees. Since the creation of the State of Israel, this denial of responsibility has been based on two sets of arguments. First, Israel states that the problem was caused by the refusal of the Arabs and Palestinians to accept the UN Partition Plan in 1947, and second, by the subsequent declaration of war on Israel. Before and during the Arab states’ attack on Israel, Palestinians would have been urged to leave Palestine and come back once the war was over. Moreover, the refugee problem could have been solved if the Arab states which hosted Palestinian refugees had absorbed them. The admissibility of the transfer of Palestinians to Arab states and their assimilation in these countries has always been an important ‘solution’ proposed by Israel for the refugee problem. After 1967, the Palestinian land annexed by Israel in 1948 was completely ignored in the on-going and proposed peace talks, both by Israel and international mediators. The solution of the conflict concentrated on the 22 percent of Palestinian land represented by the West Bank and Gaza. The right of return to the 1948 Palestinian land was completely removed from any peace agenda. Attempts by different peace negotiators to forget about Palestine and concentrate on the West Bank and Gaza, thus allowed Israel to end any discussion of the right of return and retain Palestinian properties seized in 1948. 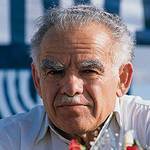 However, for the Palestinians, the events of 1948 remain at the heart of the matter. They reason that an end to the conflict can only be reached by addressing the wrongs perpetrated on Palestinians in that period. Israel has occasionally accepted the repatriation of a limited number of Palestinians. This was the case during the conference of Lausanne in May 1949 when Israel agreed to the repatriation of 100,000 Palestinians to their homeland in a final peace settlement. However, repatriation of this number never took place, and Arab countries and Israel sparred over the implementation of the protocol almost immediately after signing it. According to Israeli historian Ilan Pappé, Israel agreed to it because it was a condition of UN membership. Once Israel was admitted to the UN, it retreated from the protocol it had signed since it was completely satisfied with the status quo, and saw no need to make any concessions with regard to the refugees. The situation indeed remained unresolved. On 11 December 1948, the General Assembly of the United Nations passed Resolution 194, but the State of Israel (its membership of the UN was subject to the endorsement of the resolution) blocked the return of Palestinian refugees from day one (most of them ended up in neighbouring countries), apparently for security reasons. In reality, however, the campaign of ethnic cleansing was aimed at constructing a predominantly Jewish composition of Israel’s population. 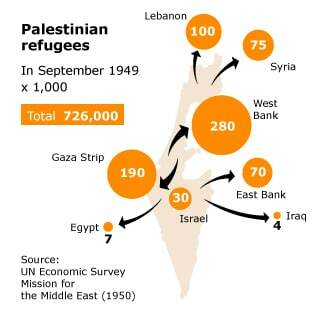 Estimates of the ‘1948 refugees’ vary from a low of 520,000 (initial Israeli official estimates) to a high of 850,000-900,000 (initial Palestinian sources). However, most observers today concur that the estimates of the United Nations Economic Survey Mission (ESM) are the most accurate. According to the ESM, in September 1949 the total number of refugees did not exceed 774,000, including 48,000 displaced persons in Israel proper: 17,000 Jews and 31,000 ‘Arabs from Palestine’. The remaining 726,000 refugees settled in neighbouring Arab territories (see infographic). Out of the total of 774,000 refugees, it was estimated that 147,000 were self-supporting, bringing some 625,000 refugees in need of relief assistance. 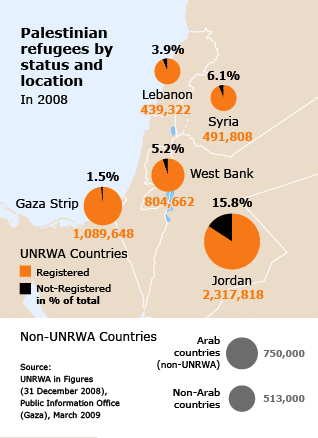 From the outset, the Palestinian refugees have been categorized by the international community, including the Arab countries, as a specific refugee category. Indeed, both the 1951 Convention Relating to the Status of Refugees and the UNHCR Statute of 14 December 1950 exclude those refugees who ‘are at present receiving from organs or agencies of the United Nations other than the United Nations High Commissioner for Refugees protection and assistance’ (article I.D). 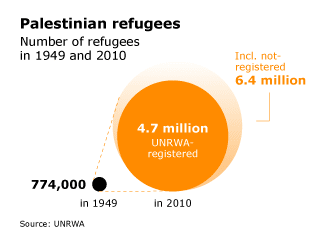 This was the case for the Palestinian refugees registered with UNRWA. 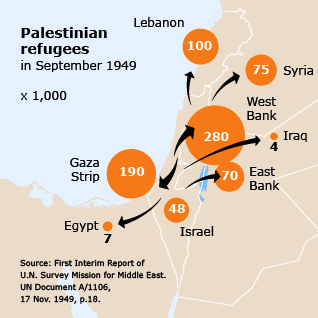 Although the Palestinian refugees are not mentioned explicitly, the discussions preceding the adoption of the 1951 Convention Relating to the Status of Refugees and the UNHCR Statute indicate that UNRWA-registered refugees were the one group of refugees targeted by the exclusion provisions on political grounds. 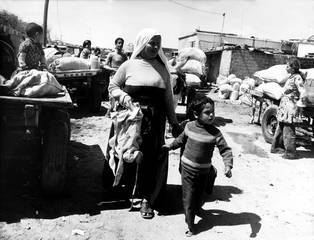 While the Western countries were concerned that the very sensitive Palestine refugee issue would burden the UNHCR mandate, the Arab countries insisted that the Palestinian refugees be treated, not as any other humanitarian refugee group, but as a specific group to which the United Nations Organization was politically committed on account of its involvement in the creation of the refugee problem. The fact that UNRWA’s humanitarian mandate was limited to the provision of basic services (primary and vocational/technical education, health care and social services) and did not include any of the UNHCR’s human rights protection activities did not raise any concern at the time. Political considerations prevailed. Moreover, it was believed that the Palestinian refugee issue, at least its humanitarian aspects, would be settled in the short term. 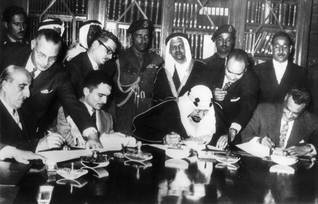 The 1951 Convention included, for that matter, an ‘inclusion clause’ ensuring the automatic entitlement of refugees benefiting from the protection of the 1951 Convention if, without their position being definitively settled in accordance with the relevant UN General Assembly (UNGA) resolutions, assistance from UNRWA had ceased. 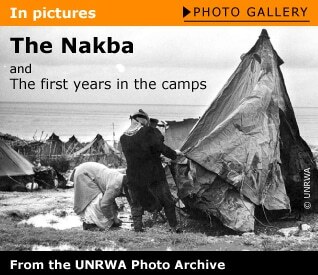 The perpetuation of the Israeli-Arab problem, and the ensuing extension of UNRWA’s mandate, turned the refugees’ status into a liability whenever they were mistreated or discriminated against by the host countries. 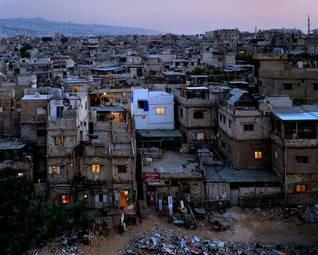 The protection gap proved all the more extensive as it eventually covered all Palestinian refugees living in the Middle East, including those not registered with UNRWA. Of the attempts made by the Palestine Liberation Organization (PLO), or by human rights groups from the 1980s onwards, to have the UNHCR and/or UNRWA extended in order to protect the Palestinian refugees’ existence, none succeeded. This was the case during the various episodes of the Lebanese Civil War (1975-1990) and during the Second Intifada (since 2000). Both UNRWA and the UNHCR have forcefully insisted on the operational (the former) and administrative (the latter) limitations of their mandates. UNRWA‘s unique institutional and operational characteristics have also contributed to singling out the Palestinian refugee issue. The Agency was created as a result of UNGA resolution 302 (IV) of December 1949. A temporary humanitarian agency, it was tasked to pursue the international emergency relief programs started in 1948 in order to secure the survival of needy refugees (until December 1950), and contribute to their socio-economic reintegration through public works programs (until June 1951) in five operational territories: Jordan, the West Bank, the Gaza Strip, Lebanon, and Syria. After its public works programs failed to induce the collective reintegration of refugees in the host countries in the early fifties, the Agency strove to adapt its general educational, health, and relief and social programs to the evolving needs of an ever growing registered refugee population. With unsustainable financial resources, UNRWA’s relief and medical services helped the refugee communities to recover from the ordeals of forced migration displacement, including starvation, and vector-borne or water related communicable diseases. Simultaneously, the Agency’s primary education and vocational/technical training programs gradually enabled them to move from total dependency on UNRWA’s rations towards self-sufficiency, thus contributing to the individual integration of many second and third generation refugees in the wealthy oil economies of the Middle East or within UNRWA’s bureaucracy itself. 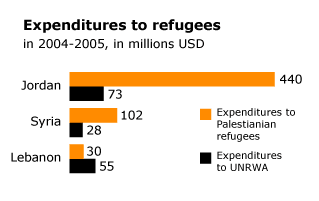 Since the late 1960s, UNRWA’s education department has been the largest in terms of personnel and budget. In December 2008, it consumed 52 percent of the Agency’s general budget, compared to 19 percent for the Health Department and only 10 percent for the Relief and Social Services Department. 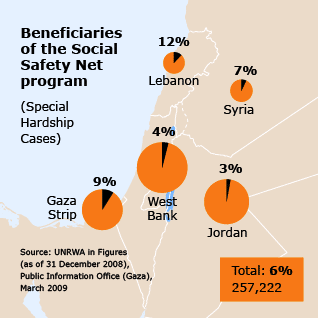 Conversely, the Agency’s relief program (food commodities, cash subsidies and shelter rehabilitation), which was the largest in terms of beneficiaries until the late 1960s, today provides benefits to an average of six percent of the registered refugees only, and with significant regional variations: from a high of 12 percent in Lebanon to three percent in Jordan. 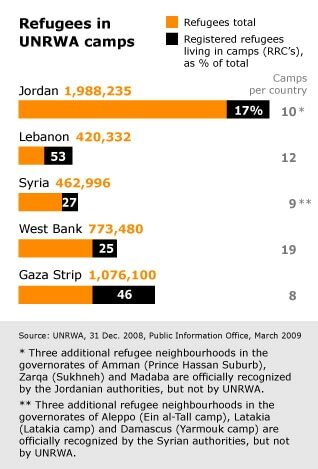 In absolute numbers, however, refugees in the Gaza Strip form the largest beneficiary cohort, followed by refugees in Jordan. Despite the shortcomings of its mandate, especially with regard to a lack of general protection, the Agency has often proved indispensable in times of conflict. Through specific emergency relief programs, it has contributed to securing the livelihoods of besieged Palestinian refugees and non-refugees, be it during the Israeli occupation of the Gaza Strip (1956), the 1967 June War, the Lebanese Civil War (1975-1991) and, more recently, the two uprisings against the Israeli occupation in the West Bank and the Gaza Strip (1987- 1994, and since 2000).